Cans of New Zealand air have sparked outrage after they were spotted on sale for almost $100. 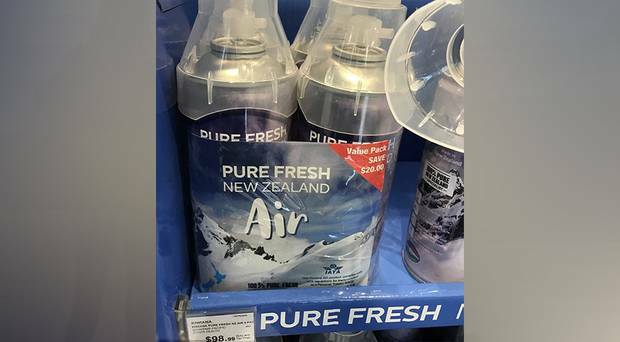 Four cans of the 'Pure Fresh New Zealand Air' were seen on display with a price tag of $98.99 at a duty free shop at Auckland International Airport, the Daily Mail reported. A photo of the 'value pack' cans - saving customers $20 off the normal retail price - was shared to Twitter by journalist Damian Christie on Thursday. "You've got to be s***ting me. Also, $98 so not exactly a cute prank gift," he posted alongside the photo. Others speculated if the air bottling required resource consent. "We have hit peak capitalism," another person said. 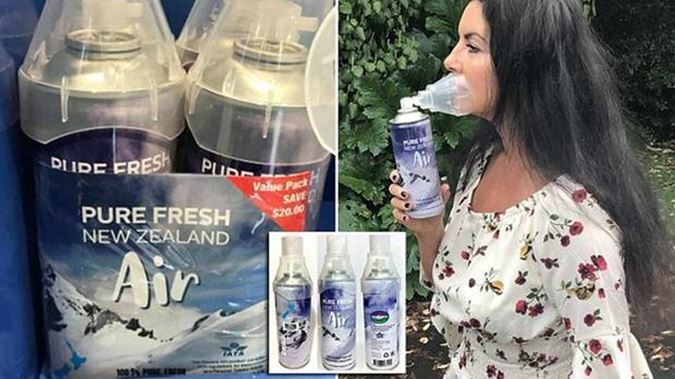 The bottles - which come with breathing masks attached - are sold around the world by a company called Kiwiana. Five-litre cans of air are sold on the Kiwiana website for $34.50 each. "New Zealand's unique position in the Southern Ocean means Kiwiana Air has crossed no major landmass before flowing over the pristine Southern Alps of New Zealand and into this can," a message on the back of the product reads. According to the Kiwiana website, the company harvests the air "above the snow line" on New Zealand's South Island. "High in the Southern Alps of New Zealand above the snow line and hundreds of kilometres away from civilisation or any human activity is where the air in your can has come from," the website states.